These are corn starch grains viewed with crossed linear polarized light. 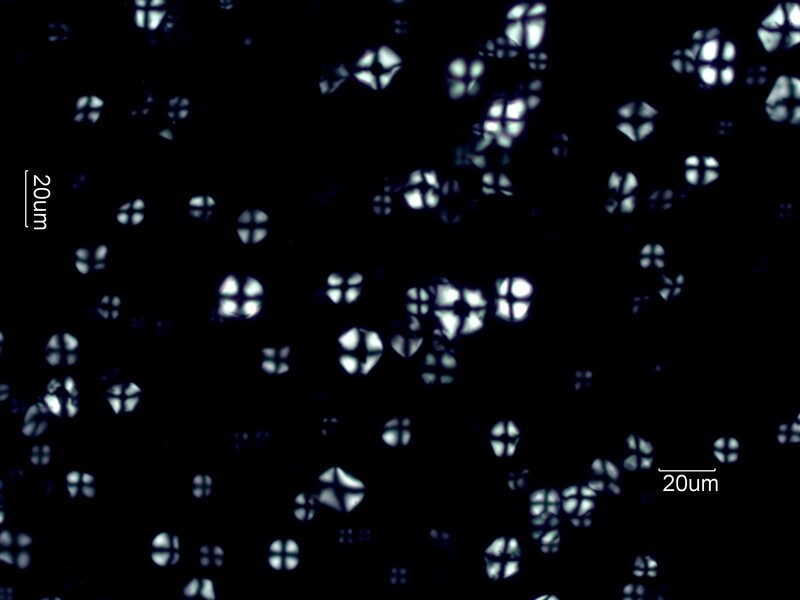 The cross structure evident here is characteristic of all spherulitic particles. A spherulitic particle is one with a structure that is anisotropic and radially symmetric. All Starches are basically spherulitic. Many monoclinic and triclinic materials, both organic and inorganic, often grow as spherulites. Corn starch is derived from Zea mays. it is by far the most common starch grain encountered in the indoor environment. It is used in paper sizing, coating plastics, coating candy, as a body powder, as a carrier for fragrances and pesticides, as an in extender coatings and paints, a mold-release in formed polymer manufacture, and many other uses. Starch is common in the indoor environment. It is widely used as a body powder, a carrier for fragrances, for insecticides, for mold-release, and many other applications. Surgical gloves must be free of rice starch because rice starch inside the body cavity can cause infection. Corn starch in the same body cavity has no effect. Corn starch tends to be polyhedral to subspherical in shape and generally 10 to 20 micrometers in diameter. The center vacuole may be spherical but is generally an elongated scar with pointed ends. It may have from 2 to 5 points forming a slit or star-like structure. If corn starch is found with significant amounts of dog dander it may indicate the presence of an insecticide. People in the locality should be questioned about the use of flea powders or powdered fresheners. When used as a body powder it is often associated with other cosmetic particles. When it is a food residue then other food particles are generally present and some cooked starch may be associated with the particles. When it is from a manufacturing process there are generally other residues from that process present. When it is from paper sizing there are generally ink or toner particles and significant amounts of paper fiber present.